Only a few more days and we will be in April, already a quarter of the year gone. The area is slowly drying out but nothing is growing, and the birds have not started nesting, it will require a dramatic change in the temperature to get it going but this is England and anything can happen. Have attached a couple of snow shots from the weekend, one of Stoat or Weasel tracks. Today the blackbirds were out in force see attached photo, a good mixture of mature and last years young, the young male still has a black beak. There were two pair of mergansers on the long pond and performing the mating posture see photo, pairs have been here over the years and just before laying they disappear, one pair did nest a few years ago so here’s hoping. On Friday found a load more frog spawn in one of the pools used by the natterjacks, so have moved it to one of the other ponds further south. The nats normally start laying early April and by then the frog tadpoles will have had a head start, and removing them gives the nats a better chance of survival. As Bob mentioned yesterday about the old fox and first Short Eared Owl for a while have attached a couple of photos. Hi, well somewhat recovered I have been back walking the reserve and boring Bri with the odd joke or two !! On Thursday 14th Bri was topping up the south feeder and my attention was taken by the crows calling on the salt marsh. As I went to see the cause I saw an old dog fox meandering amongst two crows. Now crows take cockles and mussels and break them open for food. Now this was an old fox with a bit of a limp and he was scavenging for any leftovers. I quietly called Bri and we observed the fox for a few minutes. It looked at us a couple of times but nonchantly carried on eventually disappearing into the gorse. We have suspected for a long time that there was a den in this area. Today, Sunday Bri sighted a short eared owl it was in flight and went out of sight towards the airfield. We decided to follow it. Within 2 minutes Bri saw it sat on top of a thick wooden post. Almost blending in with the post, as with the fox he took a few photos as it looked imperiously towards us. After a minute or so it took flight and disappeared behind the willow trees. We thought we might see it again hunting but no such luck. The last time we saw a short eared owl was 9th August last year. Over the weekend Art Gene, contracted by Natural England, have been interviewing the local public at North Scale, West Shore and Earnsy Bay, as part of their initial research into what people would like to see done to the North End reserve, if anything. It will be very interesting to see what the majority of views are, my personal preference is to leave it alone, as one of the best natural wild landscapes. Today it was extremely cold with a biting easterly wind, yesterday I found some frog spawn in a flashing and was going to transfer it to a safer location but today the area was frozen solid, will have to wait for warmer weather. At the feeders there has been a Chaffinch that hovered over the food before landing and when watching today noticed one of it’s legs was not being used. 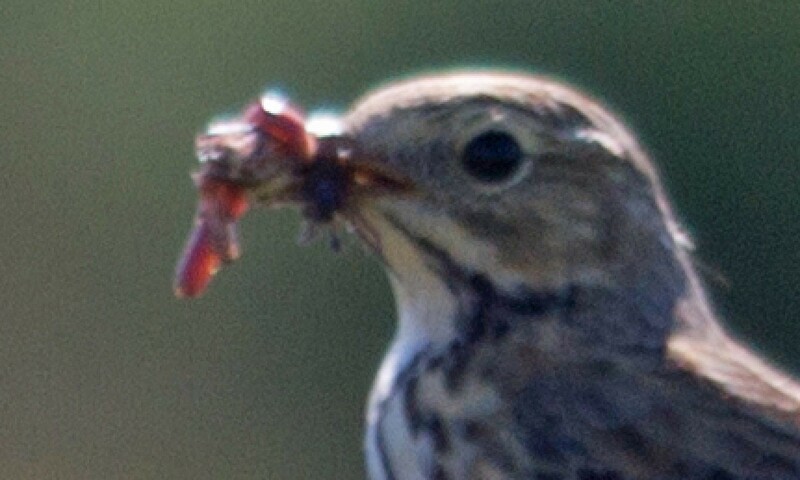 From the photograph it can be seen covered in a white fungus which could be caused by the Scaly Leg Mite, this is the second one seen at the feeders. Even with this problem it appears to managing at the moment. Well it’s been the first rain for about four weeks, just when we were just getting used to the dry, the area has dried out quite a bit but some paths are still inaccessible without wellies. Bob has been told to rest and take it easy for a couple of days, so there is just me, the dogs and a corny joke free zone. This afternoon came across a dozen Carrion Crows, eight in one tree and four in another, don’t often see them in flocks. They sat silently in the trees and were there for approximately five minutes before slowly flying off in pairs and in different directions. Crows are very intelligent and I wonder if this was a meeting to establish nesting areas, any ideas?? We have had some stunning mornings this week and spring is definitely here. Each year five or six pair of Canada geese nest on islands in the long pond and in amongst the pairs are a trio, comprising of a pair of Canadas and a male Greylag, see photo. We have never seen an odd nesting pair but they must exist, see photo of the result.